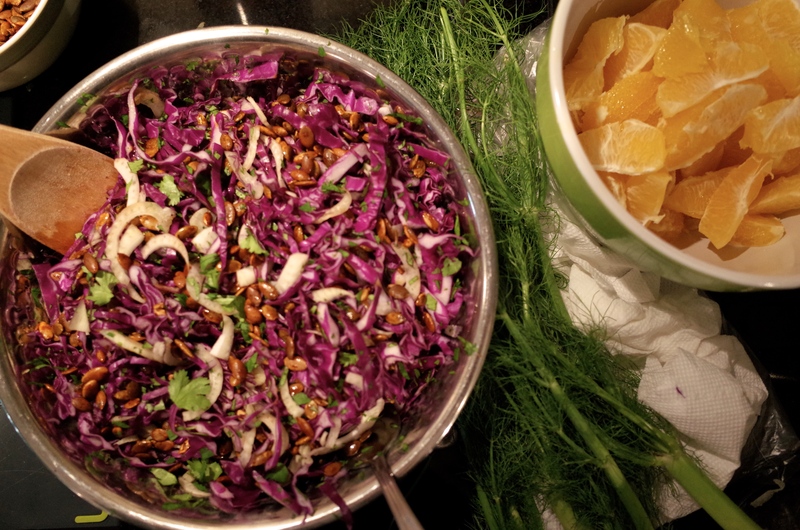 Red cabbage salad with fennel, orange and pepitas (a new recipe for 2014, not from one of my cookbooks). New Year’s resolutions don’t work. You know this. I know this. It is fact. Take my 2014 resolution—to listen to, and delete, my voicemails. Sounds easy enough, right? Well, there are currently four unplayed voicemails on my iPhone, but that’s because I ditched my old phone (and its 90ish unplayed messages) a couple of weeks ago. Or take my 2013 resolution—to floss. I think I’ve made that one four or five times now. Never works. I’m an avid brusher, but as my dentist will tell you, I just don’t floss. New Year’s resolutions don’t work because we resolve to do things we don’t really want to do. Sure, they’re often things we should do, things that the imaginary miniature mother living on our shoulders would nag us to do (in between scolding us to put on a sweater and asking if we want some tea). But unless you actually want to complete your New Year’s resolutions they won’t stick. Just ask the packet of floss in my bathroom drawer. So, this year I’m going to try making promises I want to keep. Now, let’s see how I do in 2015. • … to train for and run my first marathon. I’ve been running for a few years now, half-marathons, relays, trails. I even completed a goal to run 1,000 miles in 2014. And two weeks ago, I did my longest run ever, a 16-miler on McCullough Hills Trail that felt shockingly good, despite the 1,500-plus feet of elevation gain. So it feels like this is the year to step up to the next level. Plus, I’m unemployed, so I should have plenty of time to train. • … to read more books. I don’t read enough books, and I’m self-conscious about it. I read on vacation, but at home picking up a book just isn’t part of my routine. I read the newspaper, I read magazines, I read way too much stupid crap online, but in 2015 I’m going to read more books—starting with the stack that’s been sitting at the bottom of my bed for months. • … to cook new recipes. The thing about having a cookbook collection is that people expect you to, like, cook from them, and not just, like, find all your recipes on Epicurious and make the same things over and over. This can be a problem for me. But this is the year I actually bring my cookbooks into the kitchen, which is probably where they belong, right? • … to have more weekend adventures. This falls firmly into the category of things-I-really-want-to-do-but-am-too-lazy-to-plan. So this will serve as my little self pep talk: Self, don’t be a lazy bum this year. Plan hiking trips and camping weekends. Scout out awesome cabins and cool places to kayak, and then find people who would also like to have fun and not just sit on the couch and go do these amazing, memorable things. Got it? Okay. Ready? Break! There it is, folks. Four resolutions for 2015, which I’ll start, ya know, tomorrow.